Our Physical Therapy department offers a comprehensive program that not only helps heal prevailing injuries and ailments, but reverses their effects so that you may return to your lifestyle healthier and happier than ever before. Our Manual Therapy services incorporate a hands-on approach, sometimes referred to as bodywork, to help remove restrictions in the targeted tissue. Bodywork typical incorporates soft tissue mobilization, myofascial release, strengthening/stretching massages and other techniques. These methods promote relaxation, decrease pain, increase flexibility and strength the affected areas, ultimately improving movement patterns. Our Post Operative Rehab program varies depending on the specifics of your surgery and the protocol provided by your surgeon. Our goal is to not only strengthen the area but also target the root cause of the damage so that you can return to your passions stronger than before. The Strength and Flexibility Rehab program is designed to identify weaknesses and decreased mobility and reverse any dysfunctions. In order to accomplish that, we employ a variety of techniques, including progressive resistive exercises, isometrics, plyometrics and assisted electrical stimulation, to help restore full mobility in joints and tissue. Soft Tissue Mobilization is a manual technique that breaks up mobility inhibiting adhesions in the tissue. These impediments are typically caused by fibrous (scar) tissue, inelastic tissue, tissue fluids or any other tissues that are misaligned. With Soft Tissue Mobilization, we are able to help realign tissue and remove restrictions. Our goal with this type of training is to identify any postural problems that may be negatively influencing your body and causing impairments or movement related complications. These treatments nip those issues in the bud to protect from pain, dysfunction and injury. E-stimulation uses pre-mod, interferential, TENS, high-volt, low-volt, micro, Russian and NMES to stimulate nerves. We utilize this tool to reduce pain and swelling, stimulate muscles, increase blood flow, improve circulation, prevent scar tissue formation and help mend pre-existing injuries. The Myofascial Release Technique focuses on manually applying pressure to restricted areas in the connective tissue of the facial system. This helps restore typical facial patterns and movements. Proprioception is an automatic response of the central nervous system to position, motion and equilibrium. We use proprioceptive balance training in conjunction with other forms of training to help establish connection between muscles, nerves and joints. This will help the body reach peek performance in every area of life. Ultrasound is a therapeutic modality that uses sound waves to pass through the skin and cause vibrations in local tissue. We use this device to cure acute and chronic injuries, relax tissue, break down scar tissue, promote blood flow and relieve pain and/or inflammation. Ultrasound can also be used to heat muscles prior to treatment or exercise. Muscle Energy Techniques are based on the theory of reciprocal inhibition, the process when muscles on one side of a joint relax to accommodate contraction on the other side of the joint. We use these procedures to increase range of motion, lengthen spasmed muscles or shorten and strengthen stretched muscles. PNF is form of manual therapy and flexibility training that involves both the stretching and contracting of a targeted muscle group. We use it to engage the body’s proprioceptors and inhibit or facilitate muscle use. We offer state of the art AlterG Anti-Gravity Treadmills. With patented Differential Air Pressure technology that are leading the revolution in unweighting therapy. 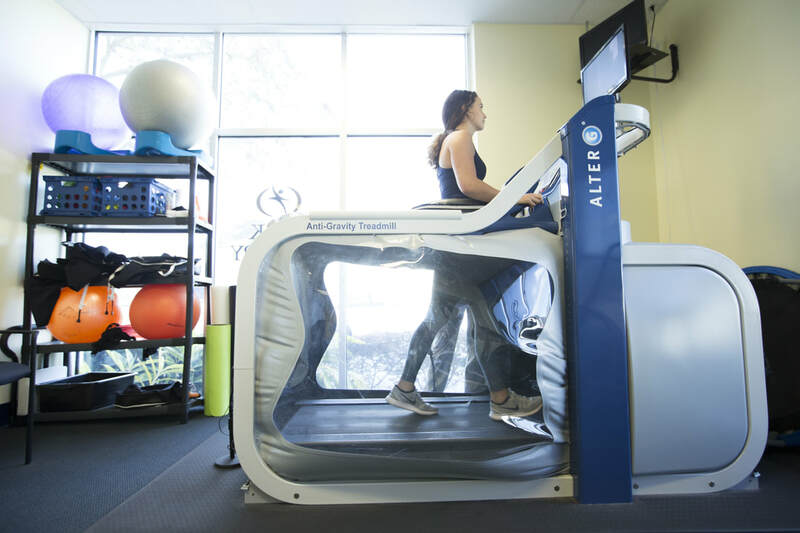 With more freedom, greater precision, and broader application, AlterG enables people to move in ways they could never have imagined. All to recover, maintain, and enhance physical function for better mobility, health, and performance. The Graston Technique, is a method that uses a stainless steel instrument to detect areas of scar tissue or adhesions in the muscles, tendons and ligaments. Once the knots or bands are located, the therapist glides the tool along the effected area to treat soft tissue fibrosis and/or chronic inflammation and help decrease pain/improve function. At Polk Therapy, we have two PT’s on staff who are trained and certified in this advanced technique. Humac Balance is a revolutionized version of computerized balance measurement and training systems. At Polk Therapy, we use it for orthopedic post-surgical and post trauma patients, older adult fall prevention, neurological and vestibular disorders and concussions. Coupled with the most popular balance board in the gaming industry, Humac Balance offers a fun twist to generic balance and weight bearing tests and exercises.